The U.S. (Vatican, Rothschild) is sending troops (Imperial Slaves) to 35 African nations under the guise of fighting Al Qaeda and related terrorists (created by the Royals' CIA). The 2nd Brigade is scheduled to hold more than 100 military exercises in 35 countries,most of which have no al-Qaida presence. 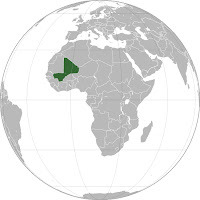 So, although there is no doubt that the U.S. will be deeply involved in the impending military operation in Mali, the 2nd Brigade’s deployment is a much larger assignment, aimed at making all of Africa a theater of U.S. military operations. The situation in Mali is simply a convenient, after-the-fact rationale for a long-planned expansion of the U.S. military footprint in Africa. AFRICOM’s [the U.S. military's Africa command] goal is to eliminate China and other countries influence in the region. Africa’s natural resources is another important element to consider because it includes oil, diamonds, copper, gold, iron, cobalt, uranium, bauxite, silver, petroleum, certain woods and tropical fruits. NATO (Vatican, Royals, US Corporates) funding, arming, simultaneously fighting Al Qaeda (Vatican, Royals, US Corporates) from Mali to Syria. A deluge of articles have been quickly put into circulation defending France's military intervention in the African nation of Mali. TIME's article, "The Crisis in Mali: Will French Intervention Stop the Islamist Advance?" decides that old tricks are the best tricks, and elects the tiresome "War on Terror" narrative. And thanks to NATO, that is exactly what Libya has become - a Western sponsored sanctuary for Al-Qaeda.AQIM's headway in northern Mali and now French involvement will see the conflict inevitably spill over into Algeria. It should be noted that Riedel is a co-author of "Which Path to Persia?" which openly conspires to arm yet another US State Department-listed terrorist organization (list as #28), the Mujahedin-e Khalq (MEK) to wreak havoc across Iran and help collapse the government there - illustrating a pattern of using clearly terroristic organizations, even those listed as so by the US State Department, to carry out US foreign policy. 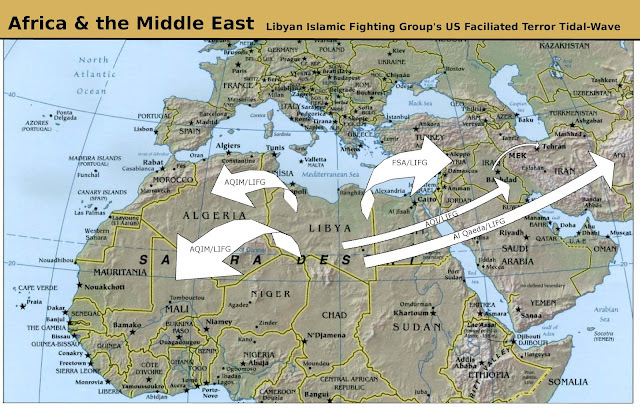 "Belhaj," referring to Hakim Abdul Belhaj, leader of LIFG in Libya, led with NATO support, arms, funding, and diplomatic recognition, the overthrowing of Muammar Qaddafi and has now plunged the nation into unending racist and tribal, genocidal infighting. This intervention has also seen the rebellion's epicenter of Benghazi peeling off from Tripoli as a semi-autonomous "Terror-Emirate." Belhaj's latest campaign has shifted to Syriawhere he was admittedly on the Turkish-Syrian border pledging weapons, money, and fighters to the so-called "Free Syrian Army," again, under the auspices of NATO support.